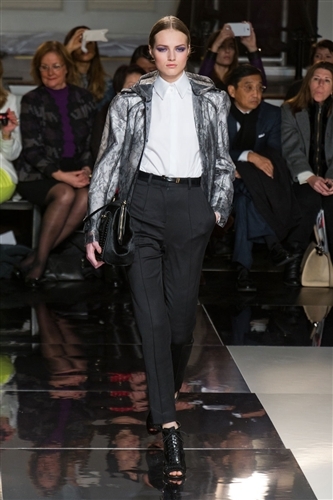 For the coming fall season, Jason Wu showcased his signature style and emphasised the feminine waist. Pinched in with black belts throughout, pieces in his collection were a combination of dark, monochrome tones mixed with a hint of bright red and cobalt blue (Michelle Obama will be proud to hear). Exaggerated shoulders and shearling fur inserts incorporated a sassy edge to what could be described as a ‘grown-up’ collection for the designer. Dresses however, were created with all round elegance in mind. 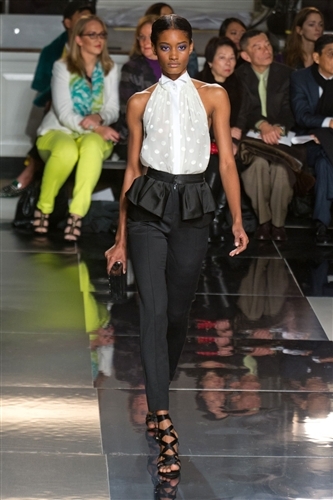 Concertina pleated fabric techniques with the romance of see through mesh torsos were portrayed on the Park Avenue catwalk. An alternative evening ensemble consisted of halter tops with fabric trains paired with satin trousers. Shirts were conservative and collars were in abundance along with grey lace panelling and a different take to the peplum frill. Overall, a spectacle of femininity and wearable pieces we can all wish for.